We are on a holiday blogging break and reblogging the top 10 posts for 2018 based on reader views. This September post ranked #9. How did I miss this insightful essay? 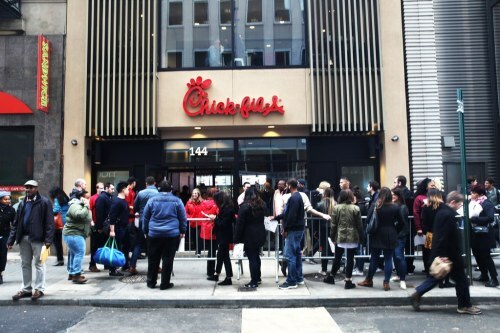 Back in April, the New Yorker published a piece by freelance writer Dan Piepenbring entitled “Chick-fil-A’s Creepy Infiltration of New York City.” While the article exposes the evils of fast foods, their advertising slogan “Eat Mor Chikin,” and his disapproval of opening their stores in the Big Apple, the writer seems more upset about the values of the founder, the late S. Truett Cathy, his son, Dan, the current CEO, and the conservative culture of the Corporation.